For eight years STRUMIS LTD has supported SteelFab and has always enjoyed participating in a successful and dedicated steel event that affords us the opportunity to meet with our many existing valued clients, new prospects and industry peers. This year has been no exception with the number of enquiries received and the general interest in our steel fabrication software products far greater than anticipated and significantly up on last year. ‘With our new stand graphics and trial products instantly available for those interested to take away we believe that this year we attracted more interest than ever before’, commented STRUMIS LTD’s Business Development Manager for the Middle East. STRUMIS LTD was also honoured at the SteelFab show this year by a personal visit from H.E Sheikh Salim Bin Abdu Rahman Qassimi, Director of The Sharjah Ruler's Office. 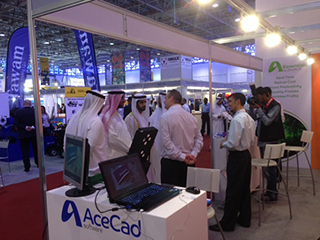 Read some of the Testimonials from our Middle East clients – click here. To find out what our steel fabrication management products could do for your business and receive your personal no obligation demonstration, please do not hesitate to contact us.